The Hungarian government was going to institute a tax on internet traffic. In response to gigantic public demonstrations against the proposed tax, the government has backed down. In my experience, the repeal of restrictive laws always corresponds with a strengthening of Pallas by transit. Pallas (ruling the libertarian non-aggression principle) is stronger when she and/or her sign ruler(s) are connected to the Sun, Mercury, and/or the North Node. 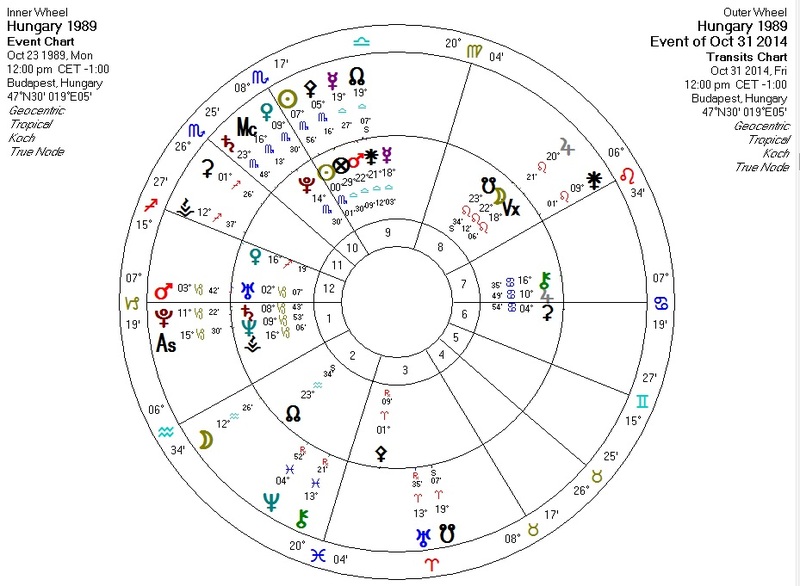 So here we have the chart for post-Soviet Hungary and the transits for the day of the announcement. Transiting Sun is conjunct transiting Pallas and both are conjunct Hungary's Sun. Transiting Mercury and North Node are conjunct Hungary's Mars, ruler of Hungary's Pallas. Transiting Pallas is quincunx Hungary's Pallas as well.